Dr. Rabab completed the MBChB from the Medical School of Mosul University in Iraq (1986), the DGO from Al Mustanseria University (1995), and the CABGO from the Arab Board of Medical Specialization in Obstetrics and Gynaecology (1997). 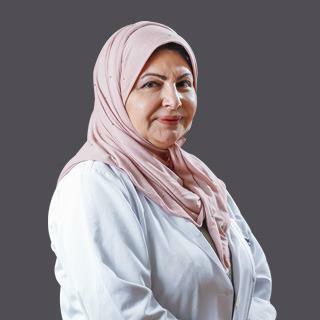 Dr. Rabab is part of several committees namely the Iraqi Medical Association, the Iraqi Family Planning, the Iraqi Fertility Society, and the Iraqi Society for Obstetrics and Gynaecology. Dr. Rabab performed rotations as SHO in various Mosul General Hospital (1986 – 1989). She was also SHO Registrar at Al Mosul Teaching Hospital (1991 – 1992) and at Al Yarmouk Maternity Teaching Hospital (1992 – 1997) where she was later Senior Registrar (1996 – 1997). Dr. Rabab worked as a Specialist in Obstetrics and Gynaecology at Samara Hospital (1997 – 2000) and at Al Elwiya Maternity Teaching Hospital (2000). She also held teaching positions in several hospitals comprising Al Mustanseria Medical School (1995 – 1997), Tikrit Medical School (1997 – 2000), Al Kindy Medical School (2000), and training of postgraduate doctors. Dr. Rabab’s special interests include Infertility, IVF, Recurrent Abortion, and Premature Labour. She has conducted a research and written a paper on “The Effect of Zinc Sulphate on Hyperprolactinemic in Fertile Women in Correlation with the use of Parlodel Alone in Combination with Parlodel to Enhance the Effect of Parlodel (Prospective Study)”, and “Measurement of Serum Zinc as a Predictor in Hyperprolactinemic Women”. Dr. Rabab speaks Arabic and English. Recurrent Abortion and Premature Labour. Iraqi Society for Obstetrics and Gynaecology.